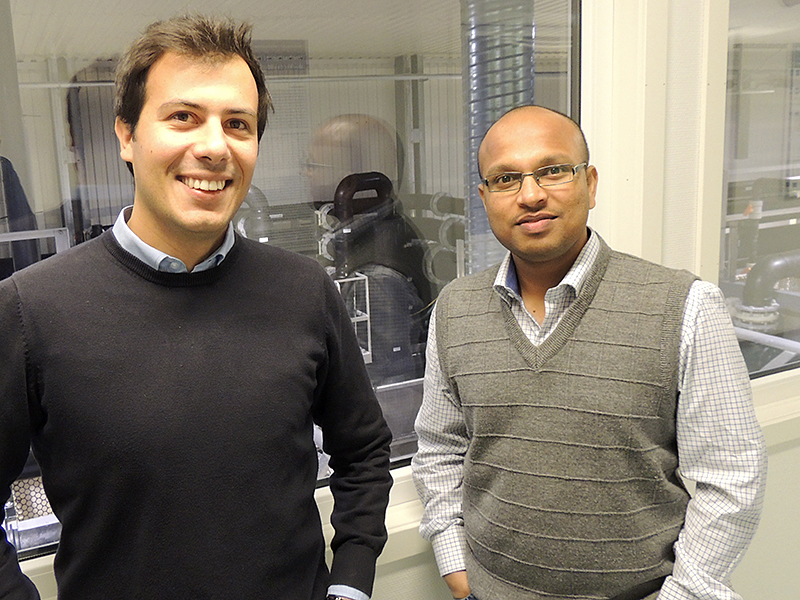 Vasco Mota and Jagan Gorle are employed by Nofima to develop closed-containment aquaculture facilities for salmon (photo: Bendik Fyhn Terjesen/Nofima). Ambitions are high, funding is available and the technology is well on the way when it comes to closed-containment aquaculture systems. This means that the road from research to implementation may be very short. This is what tempted two international scientists to move to Sunndalsøra in Møre og Romsdal, to be involved in developing the new generation of closed-containment salmon aquaculture systems. “It will be very interesting to be part of the development just now, in such a large industry. I can carry out research and see how the results are immediately implemented,” says Vasco Mota, a biologist from Portugal. Jagan Gorle is an expert in hydrodynamics from India, while Vasco Mota is an expert in fish biology from Portugal. Both are coping well with adapting to living and working at Nofima in Sunndalsøra. This is the main centre for CtrlAQUA, a centre for research-based innovation (SFI) established by the Research Council of Norway in order to promote innovation within closed-containment systems during the coming eight years. Six research institutions and 13 participants from the aquaculture industry and associated technology sectors are partners in the centre, all of whom are front-runners in the development of salmon aquaculture in closed-containment systems. One project that Mota is to work on involves studying the tolerance of postsmolts for waste products in recirculation plants. He will study, among other things, the level of CO2 that the salmon can tolerate in this typical water. “When production is made more intensive, as is the case in closed-containment systems, the level of CO2 becomes important, since the gas is dissolved in the recirculated water and may thus influence fish growth and well-being,” says Mota. “And the well-being and health of the salmon are important to ensure good growth in closed-containment systems. This is why we need research-based indicators of well-being, such as the level of CO2,” says Mota. Mota studied how fish experience the recirculation environment for his doctoral thesis, awarded by Wageningen University in the Netherlands. This university is renowned for its work on various fish species in recirculation systems. Jagan Gorle is to investigate several factors that are important when facilities are to be scaled up to the size of an olympic swimming pool or larger. One major challenge is to maintain an even flow of the water, which is optimal for creating a good environment for the salmon. “It is clearly possible to model extremely large tanks for aquaculture,” says Gorle, who gained his doctoral degree in marine hydrodynamics working in a major centre for fluid mechanics modelling in France. “One of the challenges for me in modelling water flow is that I also must consider the wishes of the biologists. I’m not used to this, but it makes the work much more interesting,” says Gorle with a smile. Closed-containment systems on land and partially closed systems in the sea have come into focus as means of protecting farmed salmon from lice and reducing the level of escapes. Such facilities have a barrier that separates the salmon from the water around the facility. CtrlAQUA is focussing on producing salmon up to one kilogram in closed-containment systems. Nofima leads the centre at which Vasco Mota and Jagan Gorle have now been employed as scientists. There, the knowledge they create will be used by industrial partners in the project. The technology for closed-containment facilities on land is well-developed, but it relates to relatively small tanks, and the potential for producing farmed salmon up to 1 kilogram on land has not been exploited. Various prototypes for closed-containment systems in the sea are being tested. It will be particularly important at CtrlAQUA to carry out research into fish well-being and how the fish grow in the facilities. The centre opened in April 2015 and results from the research, such as the water quality that should be used in recirculation plants, are already being applied by the industrial partners.